A visit to Leon Russell’s home studio led Lenise Bent to abandon film and become a recording engineer, starting at Village Recorders in the mid-70s. George Gruhn’s interest in the way old guitars were built led to his landmark “Guide to Vintage Guitars” and the transformation of used instruments into vintage guitars of great value. 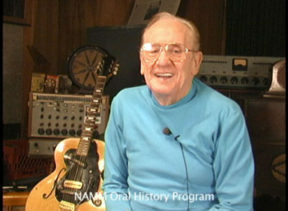 A childhood illness led Les Paul to explore how the frequency and pitch of a train’s sound made the bay window rattle; encouraged by teachers, his curiosity led to a lifetime of invention and innovation in music making and recording. Lenise Bent’s interview took place at Village Recorders her long time studio home. 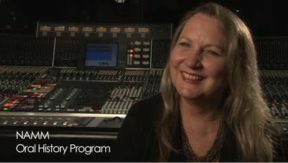 The NAMM (for National Association of Music Merchants) Oral History Project houses these and over 3,700 other video interviews with instrument builders, performers, engineers, inventors and the business people who built the American music industry since the mid 20th century. War stories are the currency of the music business. Get any group of touring musicians or engineers around a table backstage, and listen. They share anecdotes to introduce themselves, as parables, for their own amusement. So how better to capture the history of music-making in America than personal story-telling? Access to this treasure trove is free, and some of it can be found online. While maintaining its focus on collecting, the team rapidly indexes all interviews and posts a 2 – 3 minute video clip of each to the NAMM website. Just 83 of the full interviews have been edited and posted online, usually at the request of journalists or scholars. 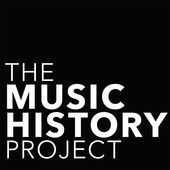 Beginning last year, the team creates twice-monthly Music History Project podcasts, often running an hour or longer. The podcasts (free at Soundcloud and iTunes) rely heavily on Del Fiorentino’s encyclopedic knowledge of music history in editing and linking the interviewee’s narrative to its larger context. 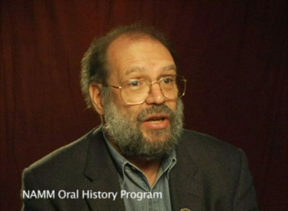 Del Fiorentino conducted his first music interview at age 14, for his non-commercial big band radio show; in 2000, with a library sciences degree, he was the answer to NAMM’s pressing need to commemorate its centenary and collect the stories of the industry’s aging pre-war leaders and artists. To call Michael Mullens a videographer understates his value to the team. He represents the newer professional path to the music industry, with a degree in music industry studies, buttressed by a childhood attending NAMM shows with his father, a music store-owner; he brings a depth of understanding of the Project’s mission that belies his brief tenure. While the project is clearly the personal passion of Del Fiorentino, who compiles the wish lists and conducts the interviews, it’s fully professional in terms of production, cataloguing and access. The massive HD video archive of raw and post-produced interviews (each hour gets a light 2+-hours of post shortly after the shoot) is stored onsite and in the cloud. Elizabeth Dale’s role as the archivist is to ensure access to the collection through thorough and systematic meta-tagging, indexing and creating finding aids. 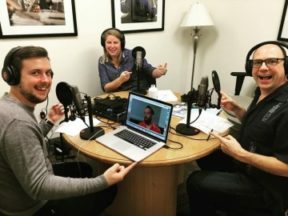 From left, Michael, Elizabeth and Dan sharing the blame (or credit) for a podcast. The Oral History Project augments the larger collection of instruments, personal papers, catalogs and magazines in the NAMM Museum of Music Making, in Carlsbad CA, NAMM’s HQ.